Here he had numerous opportunities to paint portraits in which he was marvelously successful and had few equals. He painted Cavaliers and Ladies of our city and all of them so lifelike and invested with a certain air, that...one could sense the spirit of their nobility. A servant shields the resplendent marchesa with a parasol as she sweeps out onto the terrace of her palazzo, eyeing us watchfully. Van Dyck’s portrait subjects—men as well as women—regard us imperiously, self-aware. All of the painting’s details and composition assure us of the sophistication of this altera donna, or grand lady. The marchesa’s exceptional and disproportionate height emphasizes her stature, literally and figuratively. The red sunshade held aloft extends her presence, forming a halo about her head that contrasts against a dramatic sky and emphasizes our position beneath hers. The black attendant holding the marchesa’s parasol alludes to the active slave trade from Africa to Genoa. His inclusion in her portrait probably has an artistic source in the Italian Renaissance artist Titian, whom Van Dyck admired and who portrayed black servants in his canvases. The painting closely echoes Peter Paul Rubens’ portrait of another Genoese lady, Marchesa Brigida Spinola Doria. 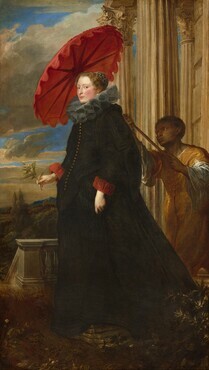 Elements such as Marchesa Cattaneo’s parasol and her architectural setting are related to the red drapery of Rubens’ Marchesa Bridgida Spinola Doria, similarly imposing architecture, terrace setting, and general demeanor of grandeur. Throughout his career Van Dyck competed with his immensely famous peer (and teacher) Peter Paul Rubens (outliving him only by a year). 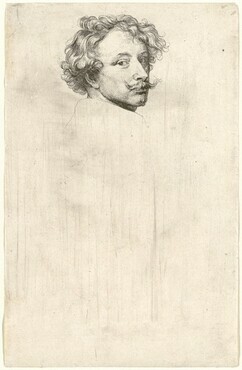 Yet Van Dyck’s style and approach were distinctive. Note, for example, is the way he made the Marchesa Cattaneo appear to float, her dress swaying, as if she has been captured in a passing moment, in contrast to the greater formality of Rubens’ portrait. Van Dyck aspired to what he called an “airy style,” interpreted to mean qualities of grace, ease, and effortlessness. In this work, even the clouds seem to carry that message as they drift over the distant landscape. Van Dyck also completed portraits of the marchesa’s two eldest children, Maddalena Cattaneo, 1623 and Filippo Catteneo, 1623. Anthony van Dyck was a hugely successful and sought-after portraitist in European courts during the seventeenth century. Despite this high profile, critical fortunes often cast him in the long shadow of his famous teacher, Peter Paul Rubens. Yet the life stories of Van Dyck and Rubens also make the two artists’ lives inextricable. Van Dyck was a child prodigy. His father, a successful fabric merchant, had enrolled him to train in the studio of an Antwerp painter by age ten. At 14, Van Dyck’s talents came to the attention of Rubens and became a frequent presence in the older artist’s studio. By the time he was 19, Van Dyck was a master in the artists’ guild and was receiving independent portrait commissions while simultaneously working as a studio assistant to Rubens. His natural gifts earned him a key role in the production of a number of Rubens’ large commissions. The artists eventually came to serve many of the same patrons, including Maria de’ Medici of France, the Dutch stadtholder Frederick Hendrick, and Archduchess (later regent) Isabella of the Spanish Netherlands. In 1620, Van Dyck struck out on his own, making his first trip to England where he started a long and fruitful relationship with the British aristocracy. 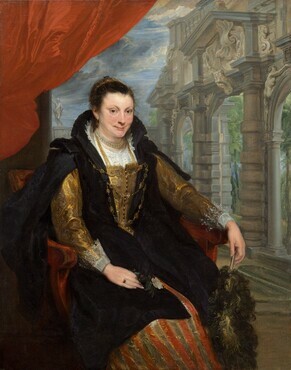 After several months in England, Van Dyck returned to Antwerp, where he painted a portrait of Rubens’ wife Isabella Brant before traveling to Italy to study Renaissance and classical art. He took a particular interest in the work of the Venetian artist Titian and sketched copies of his work in a notebook. Genoa, with its strong mercantile and financial ties to Flanders, became Van Dyck’s primary base in Italy. There, he found a ready clientele for his fashionable portraits, history paintings, and devotional and mythological subjects. In the palazzi he visited, he would have seen Rubens’ Genoese portraits of 15 years earlier and would have taken inspiration from them. 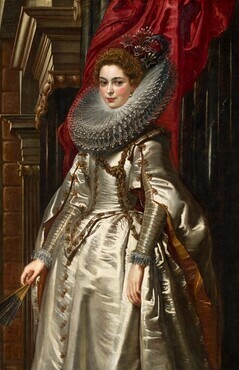 Rubens’ Marchesa Brigida Spinola Doria is the artistic forebear of Marchesa Elena Grimaldi Cattaneo. After Italy, Van Dyck returned to Antwerp. This was a fruitful period for the artist. In 1632, he was knighted by the English court (as Rubens had been) and named painter to King Charles I and Queen Henrietta Maria. In 1639 he married an Englishwoman, Mary Ruthven, the daughter of a lord and a lady-in-waiting to the queen. His numerous portraits of the Stuart monarchs and members of their court have left an indelible mark on the understanding of that period of English history, as well as on subsequent generations of English painters, such as Joshua Reynolds and Thomas Gainsborough. Van Dyck was very ill by late 1641 and died in London at age 41, several days after the birth of a daughter. Despite his young age, he left a prodigious number of paintings. Today there hundreds of extant portraits in museums around the world. Van Dyck was buried in St. Paul’s Cathedral, his tomb there destroyed by the great fire of London in 1666.